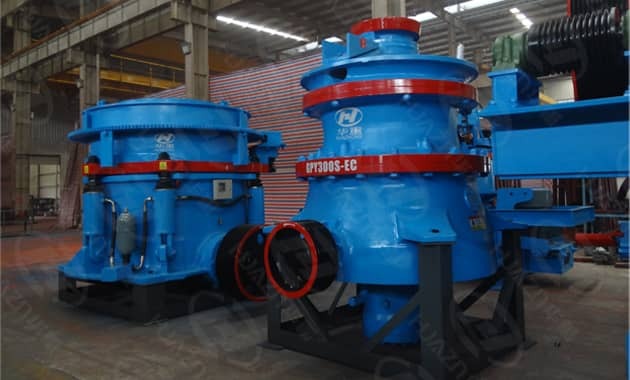 There are some advantages of hydraulic cone crusher compared with ordinary cone crusher. Based on the unique structure of spindle fixed and eccentric sleeve rotating around the spindle, the device further optimizes the design of transmission rotating parts and lubrication sealing structure. The equipment has a strong bearing capacity, and the installed power reaches a large industry of the same type with small volume, high efficiency and low noise. With full hydraulic control, the equipment is cleaned from the safety chamber to the adjustment and locking. All hydraulic operation is used. The work is fully hydraulically operated. The equipment is cleaned from the safety chamber to the adjustment and locking. All of them are hydraulically operated. The work is more stable and reliable, and the operation is convenient. . Combined with rich practical experience, the hydraulic system structure is optimized, the adjustment control is more accurate, the automatic protection response speed is faster, and the fully automated operation can be realized. It is equipped with an integrated hydraulic lubrication system and a centralized intelligent control system, which saves the cost of hydraulic lubrication and monitors the operating status of the equipment in real time. The control system is further optimized, the system is more stable and reliable, and the stable operation of the equipment is guaranteed, and the operation of the equipment is more worry-free and labor-saving. The material is crushed by the principle of laminating crushing. By optimizing the equipment and cavity type, the laminating crushing efficiency is improved, the crushing efficiency is high, the wear of the wearing parts is low, the finished grain shape is cubic, the fine grain content is high, and the finished product quality is improved. Reduce the production costs of equipment and the entire system. Equipped with a number of medium crushing and fine crushing cavity type, only need to replace the corresponding cavity type lining plate and a few parts, can be converted between cavity type, combined with lamination crushing principle, better meet the requirements of crushing and fine crushing process, to achieve a multi-purpose machine.